Battersea Power Station is a decommissioned coal fired power station located next to the River Thames to the southeast of Chelsea Bridge. The power station is the largest brick building in Europe, Grade II* listed, and is noted for its Art Deco interior fittings. A good view can be had from trains serving Victoria Station as the railway lines run very close to the power station. The power station’s iconic shape has been popularised by its appearance in a scene in the Beatles’ 1965 film Help and on the front cover of Pink Floyds 1977 album Animals. 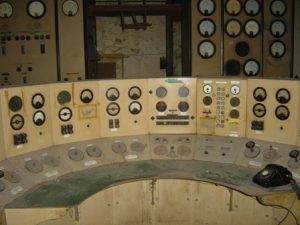 Battersea Power Station’s control panels feature on the front cover of Hawkwind’s 1977 album Quark Strangeness and Charm (a recent image of one of the control panels complete with rotary dial telephone can be seen below). In 1925 Parliament decided that the specifications of electricity output by power companies should be standardised. As a result several of the existing small local power companies (which were the norm at the time) got together to form the London Power Company and build a super power station. Construction of Battersea Power Station commenced in 1929 and the first electricity was generated in 1933. The exterior of Battersea Power Station was designed by Sir Giles Gilbert Scott (who also designed Bankside Power Station to the east where Tate Modern is now located). The control room was given Art Deco fittings and the turbine hall featured Italian marble. The original power station was completed in 1935. Battersea Power Station originally had two chimneys. 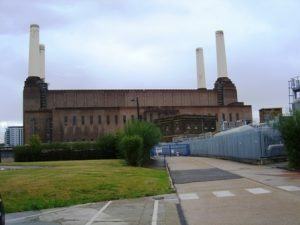 In 1955 in order to meet rising demand for electricity a new power station called Battersea B Power Station was added to the east side of the original power station (now called Battersea A Power Station). Battersea B is a mirror image of Battersea A and the combination of the two results in a well balanced symmetrical building with a chimney in each of the four corners. Due to post-war austerity the interior was not as lavishly finished as Battersea A Power Station. The power station was decommissioned in 1983. Battersea A Power Station was closed in 1975 and as a result of public concerns Battersea Power Station was listed as Grade II in 1980 (upgraded to Grade II* in 2007). Battersea B ceased producing energy in 1983. 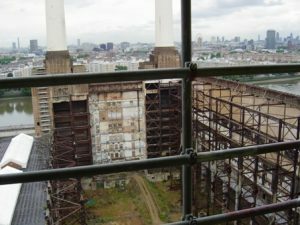 Subsequent to it’s decommissioning Battersea Power Station was gutted as part of plans to construct a theme park on the site. However this – like later plans for the site: offices shops and a hotel (granted permission 1990); a retail, housing and leisure complex (granted outline permission 1997) – came to nothing and the power station is falling apart having been empty for nearly 30 years. It is on English Heritage’s Buildings at Risk register. Frequent events take place in a marquee set up in the boiler house which sits within the shell of the building and the site is to be used as a mustering ground for police during the Olympic Games and Paralympic Games. Peregrine falcons nest on the site, this is a protected species and a metal gantry has been built in the grounds so that the birds can nest in peace while essential maintenance work is carried out on the building to prevent it deteriorating further. Planning permission was obtained in November 2010 by Irish company Real Estate Opportunities for a mixed use development including homes, offices, a hotel and leisure facilities. Implementation of the permission is dependent on full restoration of the power station and a contribution towards the Northern Line extension from Kennington via Nine Elms to connect the site to the underground railway network. However the power station is now in the hands of creditors (state owned banks in the UK and Ireland) and was put on the market again in late February 2012. 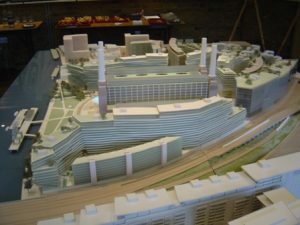 A £400 million bid for Battersea Power Station was accepted from two Malaysian firms in June 2012. A representative for the prospective new owners has stated that the building will be preserved and that for the interim they are committed to following the approved plan.